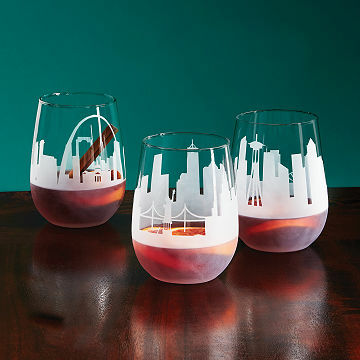 These stemless goblets feature iconic city skylines that wrap around the glass. Inspired by her love for her hometown, Baltimore native Stephanie Miller created wine glasses etched with the skyline of Charm City as a gift for her wedding party, and a series of city glassware was born. Each set of two stemless goblets features an iconic cityscape that wraps around the glass in a continuous panorama. They make great gifts for wine lovers, travelers, newlyweds, or anyone who likes to toast to their hometown pride. Glasses made in the USA; engraved in Mt. Pleasant, Pennsylvania. Great gift idea for friends and clients that visit South Florida and have a take home gift of the city. A unique gift for modern newlyweds. I love giving gifts that are personalized. It shows that you really put a lot of thought into the gift. Wonderful memory for my son and his wife. These were very nice glasses - really classy! This product was a gift for a coworker and it was very well received. Good quality, great gift! This was a perfect gift for a New York-loving friend. She loved them! Well received ! Would definitely buy again ! Perfect for anyone who has pride in their city. Great conversation piece. Bought this for one of my sisters for her birthday.